"Castle Of Glass" is the sixth track off of Linkin Park's fifth studio album, Living Things, and the third single to be released from it. The track was used during the promotion of Danger Close Game's Medal of Honor: Warfighter, which is the third song the band has contributed to the franchise. "The Catalyst" was used for the 2010 Medal Of Honor game, and "Lies Greed Misery" was also used for Medal Of Honor: Warfighter. The single was released on November 12, 2012 with proceeds going to the Help for Heroes campaign. The physical single was released on February 1, 2013 after being pushed back several times. A digital EP was released on March 22, 2013 in Europe. Pretty much everything through the first chorus remained unchanged from the initial demo version of the song to the final, album released track, as revealed by Mike Shinoda. 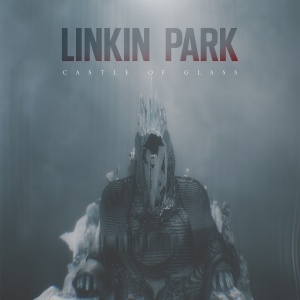 Shinoda also cited "Castle Of Glass" as an example of Living Things's more personal themes, stating "This album tends to be a little more of a personal record, compared to the last record, which I guess I would say was a little more political. And this song is an example of that; the lyrics can have multiple meanings, be it a soldier’s story [or] an individual at home, dealing with a personal relationship. [And the video] is really mostly narrative; and it’s kind of the story of the families and the soldiers that this game is based on." Chester Bennington talked about the song, and how different the ways in which he and Shinoda had interpreted the lyrics, saying "You can look at a song like 'CASTLE OF GLASS,' which for me, has one of the most interesting opposing points of view. When Mike was talking about the lyrics, at one point he had said, 'You know, it's kind of like finding yourself as this broken part of this big machine, and feeling like you're not part of that, or trying to find your place in the bigger scheme of things.' And that can mean a solider coming home from war, and trying to fit back into society, or a person getting out of prison, or whatever. And here I am, envisioning this big, beautiful glass castle on a hill, and, like, unicorns. I'm thinking like 'Yeah, if you zoom in, I'm this little broken part of this castle that no one knows about, and I may seem like flawed and not important, but when you back up and look at the big picture, you're part of this really beautiful thing that keeps you together. And it was a really interesting twist; I think a lot of our lyrics can be taken from multiple perspectives, depending on what you want the song to be about ... they can be felt on so many different levels." Owen Pallett, who worked on "I'll Be Gone", was initially going to work on two songs off Living Things, but ended up only having time for one. Shinoda wound up composing the strings for the other song. "Castle Of Glass", being the only song on the album for which Shinoda is credited for strings in the album booklet, is more than likely this other song. "Castle Of Glass" was remixed by band member Mike Shinoda for Linkin Park's second remix album, Recharged, and was included in Criterion Games's Need For Speed Rivals. When talking about his remix for the song, Shinoda said "My CASTLE OF GLASS remix was a journey; the verse section was the first thing I made, which originally lived in a Justice/Daft Punk kind of world. But I didn’t want the song to be two-dimensional or a rip-off, so I dirtied up the sounds and added a little of a prog-rock kind of feel. Then I added the ambient intro. After that, I had the idea to take it somewhere really unexpected, which is where the last movement came in. I think that last section is where the real musicality and magic happens, introducing the dreamy synths, new chord changes, vocoder vocals, guitar, and piano." The music video for "Castle Of Glass" started filming on July 25, 2012 and was made in partnership with the video game publisher EA in support of their first-person shooter, Medal of Honor: Warfighter, which the video features several clips from. The video was released on October 10, 2012 to Linkin Park's official YouTube page. The video depicts a young boy dealing with the loss of his father, who was killed in action. The band is shown performing in a violent storm, with pieces of shattered glass swirling around them. Near the end of the video, the boy begins looking through his father's belongings, inspiring him to follow in his father's footsteps and joining the military as a SEAL. The end of the video shows a man telling a young girl that her father, too, had died in battle. The video's final shot showcase a quote from Winston Churchill, stating "All great things are simple, and many can be expressed in single words: freedom, justice, honor, duty, mercy, hope." All of the band's performance was shot in front a green screen, with production being handled by Digital Domain and Mothership. The video relied heavily on CGI for the band's sequences, and continues the recurring post-apocalyptic theme in the videos for Living Things of the world falling apart, primarily the opening shot of Mike Shinoda, where the room he's standing in crumbles to the ground, revealing the storm that the band performs in. Slightly different instrumental through the first half of verse one. There are glitches at 0:36, 1:10, 1:28, and 2:36. "Castle Of Glass" was rehearsed for two weeks prior to its debut at the 10th Annual VGAs, where it was nominated for "Best Song In Game" in Medal of Honor: Warfighter. It quickly replaced "In My Remains" in the setlist starting in 2013, where the studio version was played consistently until January 2014. At the Concert For The Philippines in January, the band brought out Ann and Nancy Wilson from the band Heart to sing on the song, marking the first time female musicians have ever joined Linkin Park on stage for a song. Once the cycle for The Hunting Party started at KFMA Day 2014, a new version of "Castle Of Glass" debuted, with the first verse and chorus coming from the studio track, and the bridge and ending coming from "Castle Of Glass (M. Shinoda Remix)". This was dubbed the "Experience Version". It also featured a short piano transition outro leading into "LOATR/SOTD/Iridescent". Starting on the Carnivores Tour, a brief sample loop played prior to the song beginning. Beginning with the band's second show in Brazil, new elements were added to the new live version of "Castle Of Glass". Two speeches featured on A Thousand Suns, from "Wisdom, Justice, And Love" and "The Radiance", were added to the bridge and piano outro, respectively. The sample from "Wisdom, Justice, And Love" contained only the first two lines of the speech, while the sample from "The Radiance" was the whole speech. At one show in Germany, the band extended the intro of "Castle Of Glass" to allow the crowd to clap along with it. The "Experience Version" of "Castle of Glass" carried over to the One More Light tour, with the song being played far earlier in the set than ever before. The song received a new ending with Joe scratching a sample of Chester screaming "break" from "One Step Closer" over a newly remixes section. Mike started rapping over the new ending starting with the band's stop in Peru, where he rapped the first verse of "A Place For My Head". He would begin rotating in verses from "It's Goin' Down", "A Light That Never Comes", and "Petrified" during the European leg of the tour. At the memorial event for Chester Bennington, the studio version of "Castle Of Glass" was performed for the first time since the end of the Living Things cycle, albeit in a different key and with a slightly new arrangement courtesy of Adrian Young, Tom Dumont, and Tony Kanal of Dreamcar. Alanis Morisette joined the band for the performance. Mike used "Castle Of Glass" as a part of his Fort Minor setlist upon its return in 2015. Starting with his performance in Los Angeles, Mike performed a remix of his own remix of the song, and mashed up "Kenji" with the bridge of the remix, performing the entire song. "Castle Of Glass" has maintained a consistent slot at Mike Shinoda's solo shows. At the Identity LA performance, Linkin Park band mate Joe Hahn joined Mike for the song. Mike also played guitar on the song at this show. Beginning with his show at Amoeba Records, Mike performed a new arrangement of the song in a different key and with him playing piano. "Castle Of Glass" was first released to radio in late 2012 internationally, including places like the United Kingdom, Finland, and Denmark. The physical single was initially slated to be released on December 10, 2012, but was later postponed February 4, 2013. Despite that, it was released on February 1, 2013 for unknown reasons. The digital single was released on March 22, 2013. The song was certified Gold in Austria and reached Platinum in Germany, Italy, and Switzerland. The song was heavily used in promotion for EA's Medal of Honor: Warfighter, and was featured in the end credits of the game. Belgian promo with "For promotional use only - not for sale"
"Castle Of Glass" is featured in the 2012 videogame Medal Of Honor: Warfighter. A remix of "Castle Of Glass" by Mike Shinoda is featured in the 2013 videogame Need For Speed Rivals. South African alternative rock band City Of Heroes recorded an in-studio live cover of "Castle Of Glass" which was uploaded to their YouTube channel on June 6, 2013.